La Mercanti design furniture arrives in Hollywood, Los Angeles: Mr. Thomas Rezek, CEO of Secret Language LLC, chose the elegance, the original italian design and the functionality of Uno design desk, designer Karim Rashid. Cloud white desk and dark oak drawer matching are the colors selected. 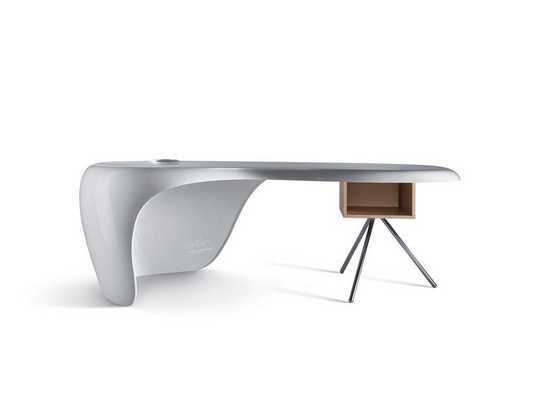 Uno desk is now displayed at the event “Karim Goes Dutch” in which Karim Rashid displayed his best furnishing and furniture accessory creations in Geelvinck Museum. The museum is set up at an ancient noble house in the Canal Loop Neighborhood of Amsterdam. Classic executive leather and wooden office desk Minos by Codutti for Ms. Chantel Corwin at Zynex. She has been in charge to follow up the interiors of the new executive office of Mr. Thomas Sandgaard, founder, chairman and CEO of Zynex, with italian office leather furniture. Minos is constructed from top and sides veneered in Bubinga wood, lacquered with several coats of polyurethane varnish with a matt finish. Very nice professional experience dealing with Dorinda Yu, Fashion Director at Century 21 Department Stores, New York. Century 21 is an exclusive stores destination for incredible private sales on top designer brands: afford to look great anytime. Dorinda likes italian style and chose the great aesthetic impact of Della Valentina for the executive area, where the quality and the preciousness of the ranges create a perfect balance between functionality and design. Arper brand for the the meeting area, fresh and sinuous in design, light and versatile in use, original in aesthetic, it synthesises the values of Italian design world. The reception is strategically important for C21, providing, in a sensational and appealing way, an atmosphere of work, furnishing and architecture. The Factory collection by Sinetica combines refined semplicity and versatility to convey a unique style everytime: in any situation, via all the senses. Mascheroni armchairs for the office and contract environments, on its own it is a quiet, comfortable executive place or, grouped, a serene space for waiting or meeting. If somebody has the taste for a unique piece that will be treasured for generations, we will be delighted to help him! Eos by Las Mobili for Dr. Siamak Agha-Mohammadi MD, PhD, FACS: La Mercanti supply again the prestigious US market with the exclusive private office of the famous plastic surgeon, Beverly Hills. Dr. Siamak A Mohammadi offers a wide-ranging reconstructive and cosmetic approach to brow surgery, eyelid surgery, nasal surgery, also called rhinoplasty, and facial aesthetics as well as breast and other types of plastic surgery such as tummy tucks, liposuction and body enhancement procedures. Eos luxury executive desk for his own office furniture, enriched by the italian design. Geometric forms essential expressions of a minimalist but stylish design. Fixed shelves, overlapping corners, the EOS office plays on the concept of prestige revealed by lines and perspectives of strong visual impact. University of Wisconsin in Madison: La Mercanti supplied the executive office of Dr. Thomas Zdeblick with Ora Acciaio Rho range. We have just completed an interesting project for the University of Wisconsin, after fast and professional communication by mail with Dr. Thomas Zdeblick and his nice assistants Kim Beld and Lisa Wise.